We don’t need to tell you Colorado is a pretty special place. And we don’t mind telling you that you’re a pretty special person if you want to help us keep it that way while you’re roaming around it. You already know that you can help ensure these places exist for generations to come by staying on roads and trails, keeping speeds in check, leaving campsites and picnic spots just as you found them, and following instructional signs while you’re out and about in our state. But if you want to go a bit beyond that, there are several ways you can help steward and restore our old friend that have a distinct advantage: Not only is your vacation a feel-good experience, you also get to see some Colorado's most beautiful scenery. Find outdoor-volunteer opportunities in the areas you plan to visit via Volunteers for Outdoor Colorado, from trail restoration and construction to planting, fence removal and weed removal — many of the opportunities combine with activities like family camping, canoeing and more. No experience necessary! Colorado is endowed with 58 mountains whose peaks rise at least 14,000 feet above sea level. Adventure seekers have been challenging themselves to climb these behemoths for decades and the heavy foot traffic on the high-altitude trails can be hard on the ecosystems. Volunteer vacations through the Colorado Fourteeners Initiative range from three-day trail builds to wildflower-seed collection. The Colorado Trail stretches 500 miles from Denver to Durango. It's a pathway for hikers who want to travel the majority of the state on foot, passing over mountains, around lakes and through a number of Colorado communities. Colorado Trail Foundation volunteers are continually working to maintaining its varied terrain. The foundation's volunteer crews make improvements to the trail, and visitors to Colorado are welcome to take part in the weeklong trips. The Continental Divide Trail follows the United States’ claim to the Continental Divide from Montana to New Mexico. In all, more than 3,000 miles of hiking trails constitute this grand route. As with the other trail-stewardship programs, no previous experience is required to help out. Projects range from repairing damaged sections to scouting missing trail links to building unfinished sections. 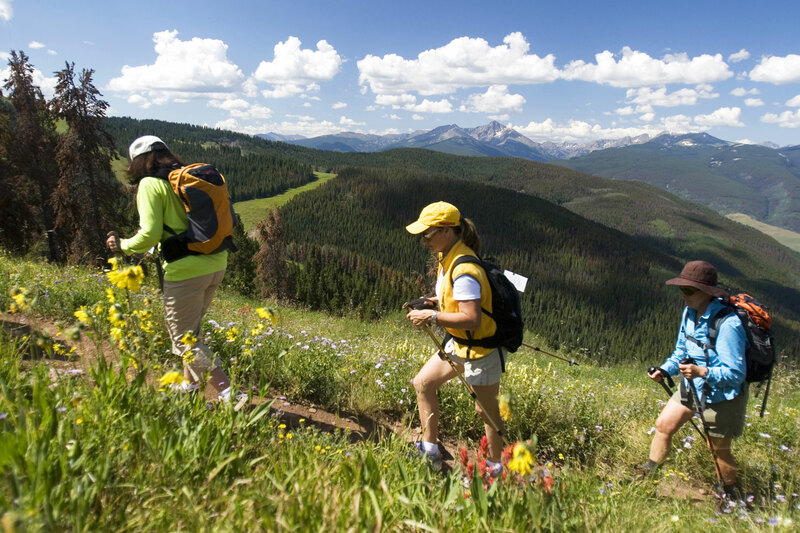 • American Hiking Society’s National Trails Day (first Saturday in June), dedicated to connecting more people to the nation’s trails. • Friends of Dillon Ranger District coordinates projects each summer to construct new trails, install structures and maintain general drainage in Summit County’s forests. • Wildlands Restoration Volunteers organizes ecological-restoration projects from seed sowing and willow harvesting to flood and habitat restoration. • The Greenway Foundation hosts two Family RiverSweeps per year, which involve a volunteer project at a Denver park, then games, crafts and lunch. • Boulder Mountain Bike Alliance projects include trail building, repairing and cleaning in Boulder County. • Colorado Parks & Wildlife has varied opportunities, from developing outdoor interpretive signs to removing invasive weeds. • Walking Mountains Science Center hosts weekly volunteer days at the Vail Nature Center for removing invasive plant species, planting native vegetation, cleaning up litter and building and improving local hiking trails. • Roaring Fork Outdoor Volunteers in Basalt hosts trail-restoration projects that range from one to four days. • Denver City Parks & Recreation gives groups and individuals the opportunity to keep Denver parks and green spaces beautiful through a variety of community cleanup events. • Aspen Center for Environmental Studies offers smaller-scale volunteer opportunities like maintaining their nature preserve and garden or observing and recording activities in local ecosystems. • Durango Nature Studies hosts community site work days and volunteer opps at their 140-acre nature center. • San Jan Mountains Association in Durango offers an Adopt a Road/Trail, where you can adopt a public lands road or trail in the San Juan National Forest and BLM lands and maintain that section. • Rocky Mountain Field Institute actively engages thousands of community volunteers every year through the completion of trail and restoration projects that help conserve and protect our treasured public landscapes in the Southern Rocky Mountain region. • HistoriCorps works with volunteers to save at-risk places like settlers' log cabins nestled between cliffs and canyons, century-old fire lookout towers still standing watch on state's highest peaks, or the remnants of delicate mining infrastructure in alpine meadows.